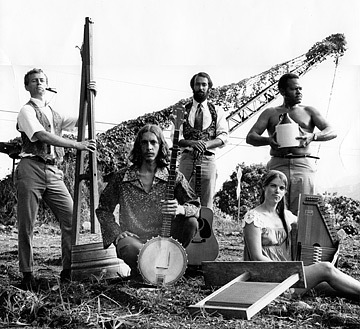 Original members of The Kapakahi Jug Band are shown below. Kapakahi, a Hawaiian term which means "mixed up," practiced off and on through the years, but an album they recorded in 1981 has since resurfaced in Japan and on the Internet. WHEN YOU PLACE chin in hand and, starry-eyed, ponder deeply and dreamily upon the provenance of jug band music -- don't kid yourself, there are people who do exactly that -- consider this: The Kapakahi Jug Band has been around longer than virtually every other band in Hawaii, at least among those bands whose members aren't related. This is their 39th anniversary. A big deal for a wedding anniversary, bigger for a band, for being in a band is like "herding cats," as the Kapakahi Jug Banders like to say. They also say, "If you wanted slick, we would have practiced," which is likely another reason they're still around. But the real reason for such longevity is that the Kapakahi Jug Band is less a group of individuals playing in lockstep than a freewheeling vision of musical utopia. They are united for the musical common good rather than riding it as a vehicle for personal acclaim. It's a good bet the members are all Democrats, and they tend to come and go over the years. What remains is the olde-timey feel-goode groove of infectious melodies played on the simplest of instruments. But there has been a development in the band's history, an unseen pitch out of left field. They recorded a self-titled album in 1981 -- back when albums looked like vinyl pizzas, kids -- which, fun at the time, became a dusty, long-forgotten souvenir of days past. But then -- remember the smitten jug-band aficionados of three paragraphs past? -- this album was rediscovered by Buffalo Records of Japan, a label that seems to specialize in such honestly traditional music. Now tarted up on compact disc, the album is available again and selling respectable numbers in Japan. In the United States it's getting thumb-ups from hip online sites such as CDbaby.com. All of which is reason enough for the original members of the Kapakahi Jug Band to declare a reunion. We caught up with them at a party high above Sierra Drive and tried to encapsulate the band's complicated history: Flow charts were needed, with circles and arrows and diagrams and captions appended. It was a confluence of influences. Punahou graduate Jan Killam cobbled together an "All Girl Jugless Jug Band" for a school talent show in 1965, which attracted banjo- and guitar-playing Pan Wilson -- the poor chap had been featured in a Star-Bulletin cover photo that year, headlined darkly, "HIPPIES INVADE HAWAII!" They hit Honolulu's sleepy folk circuit, in turn alerting University of Hawaii art professor Duane Preble, a washtub-bass player with keen sense of both rhythm and high camp. He drafted Jan and Pan and some other students to play at his show, "Art from Recycled Waste." Well! That was way too much fun. A lineup emerged, fluid, to be sure, but possessing bonhomie and chops enough to play almost anywhere and raise a smile. Key members also included singer Janice Hanley Taketa, guitarist and woodsmith Bart Potter, mighty fiddler Autumn Hancock, horn player Don Sharp, jug player and shoutist Richard "Pee Wee" Drake and musical saw player Jerry Stewart, who was a carpenter by day, natch. The last two have since died, alas, but dozens have sat in over the years, such as trombone player Brien Matson. The current lineup only does a few gigs a year, but they regularly bring along a bevy of fans. "WE RECORDED the record and kind of forgot about it," recalled Hancock of that 1981 album. "Luckily, the Buffalo Records guy tracked us down through the band's Web site that Pan operates, and a deal was struck. 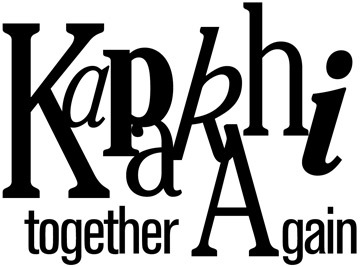 We -- the Kapakahi musical goofballs -- we're getting royalties! Thank God for the Internet. And since some of the original members are so split up -- I'm near San Francisco, Jan Killam's up in Washington, Pan's in Massachusetts -- we were able to discuss this via e-mail and figure out our piece of the action." "We had no idea if the original record was even still copyrighted," said Wilson. "I had no idea this old record was of marketable quality. It took us by surprise. I guess third parties hear more clearly!" Wilson explained that jug music grew out of a rural street-corner tradition of getting melodies and rhythms out of everyday objects, something that combines blues and ragtime, and became a subgenre of the folk explosion of the 1950s, led by the admirable Jim Kweskin. "It's fun and accessible and it's never been slick, so naturally I just gravitated to it," said Wilson, and Hancock nodded. "We came back with a little trepidation after all these years -- have we changed that much? -- but no, we fell right into it. Just like a fish on a bicycle." "Welcome to our 39th reunion!" called out Killam. "We recorded this record in 1981 and then never heard it, because none of us could afford turntables. And then there was the glowing review on CDbaby.com, and we were naturally astonished that there must be another band out there with the same name. ... We're getting royalties!" "Enough to pay one electric bill," laughed Preble. "I went out to dinner on mine!" said Hanley Taketa. 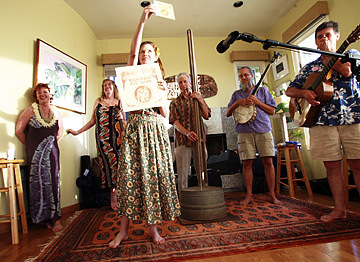 Members of the Kapakahi Jug Band gathered for a reunion Sunday at the Maunalani Heights home of Janice Hanley Taketa, left. Performing were Autumn Hancock, Jan Killam, Duane Preble, Pan Wilson and Bart Potter. They backed into a Texas-swingy arrangement of "Just Because," which morphed into "Bill Bailey" and featured solo runs by Hancock and Wilson, and then it was Wilson enthusiastically Al-Jolsoning it up with "Somebody Stole My Gal," frailing away on the banjo, then rattling into the 1932 hapa-haole classic "Honolulu, How Do You Do." In the back of the room, Cris McGowan was smiling along with the familiar lyrics. "I've been a fan for, gosh, 32 years, and they sound better than ever. They'll play anywhere. I used to see them on the side of the road at symphony runs. I used to have a friend at WGBH in Boston who played this kind of music on his radio show, and I gave him the record. He played it, and incredibly, Pan Wilson, who had just moved there, heard it and I think he ran off the road!" And the room was singing along. "This," said McGowan, eyes shining, "is just great!"